Screen capture of 10News videoreport of OBTC meeting with Councilwoman Lorie Zapf. The first meeting of the Ocean Beach Town Council (OBTC) for the new year was highly attended (Hooray!) by both community members and local media. What motivated the crowds? Perhaps New Year’s Resolutions to be more involved, perhaps the Girl Scout cookies being sold in the back of the room, heck….even District 2 elected City Councilmember Lorie Zapf was physically present! Wow! Councilmember Lorie Zapf approached the front of the room and voiced her surprise by all of the media present, nervously laughing as she commented that she told her family she was just going to an OBTC meeting. I said to myself “Yep, Welcome to OB, Lorie Zapf”. She presented her office’s FY 2017 Budget Suggestions” for City Council District 2, dated January 15, 2016 submitted to Andrea Tevlin, Independent Budget Analyst. and funding to begin the design on the Ocean Beach Lifeguard Station. Councilmember Lorie Zapf touted herself as a crusader against Vacation Rentals citing the California Coastal Commission as being an obstacle as they are favorable towards providing affordable vacation rentals, stating that the CA Coastal Commission is only concerned about vacation rentals and not residential. Quite an brazen statement, I thought. I was also surprised by Lorie Zapf’s demeanor toward a sweet, knowledgeable representative from San Diego SurfRider. She [Lorie Zapf] quickly became quite snippy to the representative while she was being asked what her stance would be on a plastic bag ban. This unexpected behavior was not only a surprise to me, but was also questioned by others in attendance after the meeting adjourned. In general, Councilmember Lorie Zapf seemed quite disconnected, and un-knowledgeable on facts, even unable to remember the script she might have needed to memorize as she often tumbled on her own words. Finally, an Ocean Beach community member questioned our elected representative at the City level if she also represented Mission Beach, to which she replied “Yes”. “Why didn’t you take into account the ineffectiveness of their [Mission Beach] police surveillance cameras when deciding to allocate money toward placing police surveillance cameras in our community? 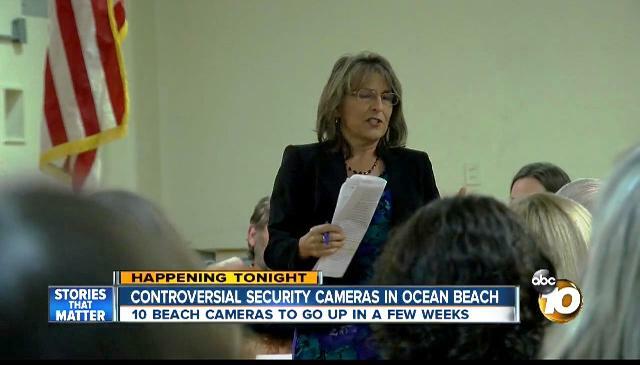 Councilmember Lorie Zapf’s response to this question, and all other inquiries regarding the controversial plan to place police surveillance cameras in Ocean Beach, was a flustered collage of unsubstantial nonsense with statements like “This is life”, “That’s how they caught the Boston bomber”, “There’s going to be signs everywhere!”, “The Community overwhelmingly asked for them”. She also repeated several times that “They are on a loop”, but never explained why that made such a difference. Bottom line was that our elected represented had no real data or no real statistics to provide to justify her action on behalf of our community, and as many present voiced, continues to be disrespectful to the Ocean Beach community. Zapf’s reply: “This is my life. Some people are going to be happy….some people are not going to be happy.” Sure, why should she care … she didn’t receive the majority of the vote here anyway. Clearly, Councilmember Lorie Zapf is out of touch with those she is supposed to represent. No matter what she thought and says she did or didn’t, let’s see if she is alert enough to realize a better process for future decisions in our Community is needed. The “overwhelming requests” she received for the cameras and all the community input she claims to have received is hard to understand when most community members that I’ve encountered are surprised by the news and don’t want them installed at all. Perhaps the “Community Voice” she hears is only of that which matches her agenda. No worries though, for as this heedless elected official scurried away from the microphone she was immediately comforted by Denny Knox, who some may recognize in connection with the Ocean Beach Main Street Association, with her gentle pats and loving eyes, apparently soothing her troubled mind. The Ocean Beach Town Council was asked several questions by a community member: to share with the community, the rationale and discussion points used to make their [OBTC] decision to publicly make a statement supporting the installation of police surveillance cameras. And to explain where their expectation of future statistics on effectiveness came from in light of the fact there are absolutely no solid statistics, available to date, able to be provided on other like police camera installations. In addition to explaining how such discussions and decisions could be made during their “dark” period of no meetings, and how a public statement could be made without full Board consensus, Gretchen Newsom, OBTC President, provided an insightful response. She noted the split of opinion within the community on the issue, the difficulty of the decision, and stating that they did receive data and statistics from the San Diego Police Department (SDPD) on the effectiveness of police surveillance cameras. The OBTC was then asked to provide that data and statistics on their website for the community to view, as none have been provided by anyone to the public to date. When asked if they received a commitment to statistics on effectiveness of Ocean Beach Police surveillance cameras in one year, a factor in their public statement, they replied that no, they have not yet received a response. When asked if, in a year, the cameras were deemed ineffective, would the cameras be removed and by what entity, or would they remain in place, not being used, but instead remain a continued visual pollution for our scenic ocean view in the Community? No real answer was provided. SD Mayor Kevin Faulconer’s office reported that sand bags will continue to be available at the Main Lifeguard Tower and also announced that the City does have a Rain Barrel collection rebate program. County Supervisor Ron Robert‘s office spoke of taking real steps toward possibly addressing crime in our Community as they invest in County Mental Health Services in the new year’s budget. Supervisor Roberts’ Representative was questioned by a community member regarding the low income housing voucher program being ineffective due to the lack of available affordable housing in which to use the vouchers, and (handling herself much better than Councilmember Lorie Zapf did while under pressured from questioning), respectfully replied in agreement to recognizing the hurdle the lack of affordable housing causes. Senator Marty Block‘s office reported SB850 which asks Community Colleges to give out four-year degrees, and informed Community Members about the “No Place Like Home” program which prioritizes housing first to homeless Residents, then once housed, focuses on providing other services such as mental health services. Congressperson Scott Peters’ Representative promoted money out of politics. Locally, the Ocean Beach Library was present to give thanks to the OB Women’s Club for their donation and to announce the library is now open until 6 p.m. on Saturdays! Ocean Beach Elementary School was present with their Principal acknowledging the support received from an OB Elementary Alumni, Steve – owner of the OB Noodle House which was earmarked specifically to help the Teachers, and also to thank the OB Women’s Club for their support of the Arts Program, stating “Art is not a luxury, it is essential to an Education”. Closing the meeting, the OBTC provided their reports indicating that they will be posting their 2016 Goals on their web site soon, announcing the success of this year’s annual Food and Toy Drive with 95 individual families receiving assistance and donations given to Veterans’ Village and the Saint Vincent DePaul program and thanking all Volunteers who assisted. Next month’s OBTC meeting will be discussing flooding in Ocean Beach with an interactive (perhaps with the Ocean Beach Historical Society involved) element – so bring “OB Flooding” photos with you! I hate to make personal attacks on anyone, but it’s hard to argue after years of watching her comments on just about every issue to come before the city council that Zapf is without fail the most poorly-informed individual in any room where she is physically present. Well said, Dave. This would be true even if she were in the same room as Sarah Palin. 1. How could the Town Council Board even propose a resolution on a subject that hasn’t appeared on the agenda of a public meeting? Don’t we mere mortals deserve to be heard? 2. I find this one-sentence resolution particularly unsatisfying as it lacks any “whereas” clauses or findings of fact. 3. I find it troubling the Board doesn’t permit the public to attend when it votes on these resolutions. We all learned in civics class the process works better when the public is present during deliberations — that’s why most organizations require it. Furthermore Town Council members deserve to know how individual board members are voting. To not permit the public to participate is undemocratic, nontransparent and, worst of all, un-OBcean. Is this a faithful way to represent the community? 4. In the years I’ve been a Town Council member, I’ve typically received an email when the Board passes a resolution. To my knowledge, this didn’t happen for the camera issue. A point was also raised about restaurant outdoor seating encroaching into the sidewalks in OB. One only needs to walk by The Joint to see this being taken to the extreme on one of our busiest corners at Newport and Cable. Imaging the Farmer’s Market crowd being funneled onto less than half of the original sidewalk. My office lease here in OB is for the walls in. Can I petition the city to allow a few more desks on the sidewalk so I can expand my business? It would appear Lorie Zapf has become senile or is suffering from a form of mental illness, taken advantage of by the SDPD to further their agenda of wasting our tax dollars to further erode our privacy. In order for there to be mental illness, there has to be mentality. This was hardly an op-ed piece, it was simply Zapf telling everyone what wonderful things she thinks she has done. This was really a paid advertisement. MB is quite the same. The recently proposed development of the old MB Elementary School site has been very controversial to say the least. The town council and the Mission Beach Precise Planning Group were almost in complete opposition to the plan presented by the developer. The developers generated Environmental Impact Report was very flawed and after lawyering and lobbying up they have discovered loopholes in the PPO/PDO so they didn’t comply with basic development rules that apply to bqoth documents. And where is the city and Lorrie Zapf during all this. The city thru the Planning commission has approved all the developers flawed plans. Lot sizes are being changed and open space as required is being gutted. Lorrie Zapf won’t even talk to her constituents and appears to be firmly in the developers camp. She simply is not interested in our concerns and has shown a callous indifference toward us. Does that sound familiar. She trumpets ribbon cutting and filling sand bags but to address our concern. Nowhere to be found. The sooner we hit rid of her the better off our communities will be. At least OB had the good sense not to vote for her, which is also probably why she is not responsive to OB regardless of the “accomplishments” she takes credit for. I was amused when Faulconer and Zapf each campaigned behind variously blue and green lawn signs. So when the cameras go up ….. will incidents such as this disappear? Where are those security officers in this instance? Anyone know if this Paul Malcolm (link above) lives in OB and if so where so we can all be on alert? Here is a video from ABC 10 on the indicent. Seriously, fund raising for $1 Mil for a wall on the beach when we need living breathing cops to protect our community not cameras to watch violations and get their jollies! Where are the priorities? Thank goodness for those that came to her rescue! This reporting is horrible. They never say where exactly the fire is but it looks like the east side of Nimitz south of the Little League fields, which is Pt. Loma, not Ocean Beach. And what “residents” are they referring to, just this guy and his small child? I’ve written the reporter for a clarification. Based on this article the cameras are coming….